Do You Have Academic Distraction Disorder (Google Subtype)? A major topic of conversation among my clients lately has been how to resist the siren song of the Internet. It offers so many ways to distract us from our goals. Although this article is about a common form of distractibility, many academics also have a more pernicious constellation of problems, and might have Attention Deficit Disorder, or ADD. If you think (or know) that you have ADD, you’ll want to check out our ADD/ADHD dissertation-coaching group run by Jayne London. What Is It About the Internet That Is So Alluring? 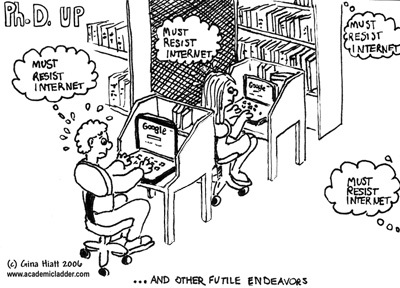 Graduate students and professors are particularly prone to Internet distraction. Probably most could have been classified as “gifted and talented” as children. It’s well known that one of the main traits of such children is rampant curiosity. There is no worse (or best) place for the curious than the Internet. Hyperlinks lead to an ever-expanding vortex of fascinating pathways. You set out to look up one citation, and the next thing you know, two hours have gone by, and you’re ordering replacement windshield wiper blades. The Internet has two kinds of distractions, according to Paul Ford: narrow and wide distractions. Narrow distractions take you further into the subject you started with, and therefore could be useful to you in your research. Wide distractions take you far afield. You might start with Hamlet and end up reading the weather forecast for Copenhagen. Clearly the narrow distraction is superior, but the wide kind is too easily accessed online. Is It So Bad to Be Distracted by the Internet? Distraction is bad only if it takes you from something of more value to you in the long run. We all need a break from heavy-duty thinking. Ford points out that being distracted is a necessary component of creative thinking. Your mind needs to wander in order to make new connections. The Internet, however, seduces you into wandering too widely, and thus leads you away from your goal. Protracted periods of passivity, including reading and surfing, stall people out. There is a tendency to feel more and more like others have said it better already. And endlessly following chains of links tends to cut off the urge to initiate a new thought. There is no way to make the Internet less fascinating. However, there are some techniques that will reduce its power over you. How often you do you have urges to go online? If you still have trouble, try working at a computer without Internet access. You may even get more done with a pad and pencil. Allow yourself set periods of time to be online, AFTER you’ve completed a set task, or worked for a set time period. She prepared affirmations to recite whenever she felt like surfing, which included repeating the date of her deadline for the current piece of her project. She set a timer for 30 minutes to reinforce the fact that it was her writing time. The result? In her own words: “Frankly, there were two results: I felt silly, and it worked.” She was able to reduce the number of times she surfed by about 80%. Give some of these techniques a try. Google’s loss will be your gain. This book, by the authors of Driven to Distraction takes a whole-life approach to dealing with the symptoms of ADD. If you are wondering whether you have ADD, or are trying to cope with being an adult with ADD, these experts will help you understand your strengths and teach you how to get support for your areas of weakness. Click picture below to read more reviews.